I read the parenting sleep books! But I haven’t had a full night’s sleep in five years, one month and nineteen days. Since the dawn of time parents have been sitting gritty eyed, infant on lap, trying desperately to get them to doze off. During my time as a mummy I have read so much about ‘training’ your baby or child to sleep. I am not a fan of the word train, it is a bit too clinical and what I do with my cat. Train your baby or child to use the litter tray. Train them to walk off the leash. ‘Babies shouldn’t sleep on their front.’ I was told many sleepless nights ago…my son can’t sleep on his front, side, back, in the light, in the warm. He can’t sleep when the monster that lives in the cupboard is talking to him or when he needs a late night sandwich with the crusts cut off. Or when his hair hurts. We tried hot milk. Put on classical music and audio cd’s but he just played imaginary cello. Laughed himself crimson listening to Roald Dahl. We tried extending his awake periods. Epic fail, if I keep him up later than seven I get a bundle of Spiderman onside wearing hyperactivity that got ‘tangry’ (tired-angry). How can we help our children to sleep better? Your body temperature needs to drop slightly before you go to sleep, which is why you just can’t sleep when the room is too hot and stuffy. 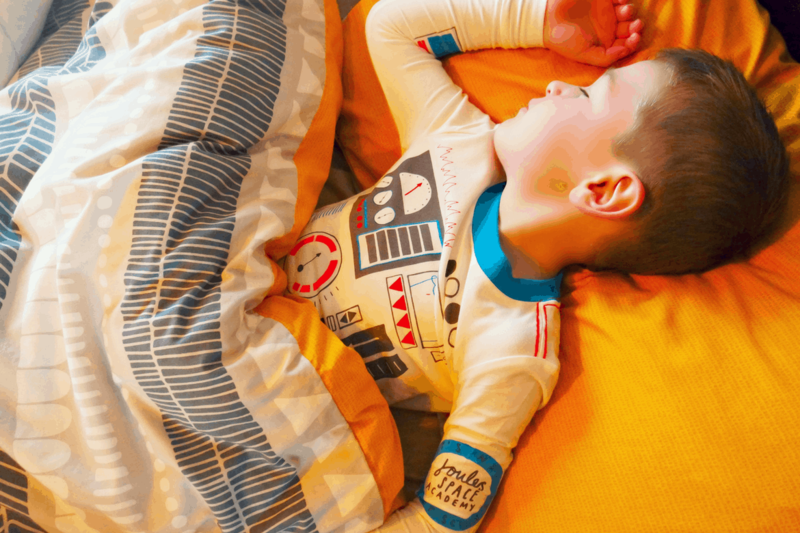 So with parental sleep deprivation in mind we want to share our simple, effective tips to ensure you stay cool and comfortable in bed this Summer. 1. Put the pillowcase, or, if you are like me and are odd and wear socks in bed put them (clean) in the fridge for ten minutes before bedtime. Or you could put a hot water bottle full of cold water in the bed. I guess that would make it a cold water bottle. I also spray the old faithful lavender mist on the underside of the pillowcase. We love Boots Re:Balance Dream Pillow Mist. Read a book to your little one, avoid tales with trolls, pirates or disgruntled rabbits. 2. Encourage little ones to drink plenty of cool water during the evening and keep a glass by the bed. Don’t forget to remind them to pop to the toilet before sleepy time. 3. We have switched my son’s duvet, even though it is low tog, to using a sheet and throw. With the sheet I prefer cotton as it is breathable. A lot of children’s sheets are helpfully/unhelpfully fitted now days but a normal single will do fine. He also has a light bed throw; Yorkshire Linens do a fantastic Marvel Justice design perfect for my superhero addicted little man. 4. Ensure the room is dark at night, use Velux blackout energy blinds you can keep a window open slightly but I wouldn’t advise this if your little one suffers from hay fever. 5. Use an electric fan, research and invest in one that doesn’t sound like an aeroplane landing. If it’s really hot, put a tray of ice and a little water in front of the fan which will cool the air even more. I keep my sons blinds down in the day when he is at school to keep his room as cool as possible. Keep your child’s room light in the day but dark at night. 6. Have a cool shower or bath before bed…This cools the body’s core temperature and gets of any pollen. Try not to let your child put in too many hot wheels cars…this does not help them sleep in any way but you have to take them all out again. What tips do you have for when the weather is warm and the littles are grumpy? Do any of these work for you?